Wow. These sound so fantastic and unique, and they look absolutely amazing. There is nothing cuter than a raspberry-topped cupcake. Beautiful! Oh yums! I swear I love your site and your cupcakes. It really really makes me wish I could bake! 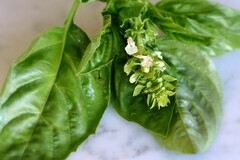 I was lucky enough to taste the most amazing basil ice cream on the weekend. It was so good I wanted to lick the bowl. It was made with ground macadamia and heavenly! These look fabulous. Wish I could bake & present like you! How about lime to go with the basil? I’ve had lime-basil juice and lime-basil ice cream and they were both fantastic. I think it would go very well with the rasberries too. By the way, your cupcakes are gorgeous. Congrats! Wow, i always wanted to make cupcakes. You blog really full of great cupcake recipes! Can’t wait to buy a new oven and try it. Great blog! I acquired some of the souffle cups. Are yours the “48” size? That’s what I got. 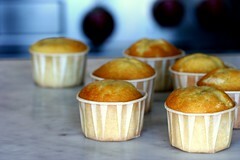 Anyway… are your recipes/cooktimes for regular sized cupcakes or the souffle cups? I am definitely going to try adding lime in this recipe the next time I make it. Great suggestion, whoever you are! Jordyn, not sure if my cups are size “48”, they are 3.25 ounces is all I know. Bake times are the same for the souffle cups and regular cupcakes, as I scoop the same amount of batter in them regardless (I use a 2 ounce scoop). Happy one year anniversary! I see you have been blogging your baking adventures for 12 whole months. The rasberry mousse looks lovely. I bought a cookbook last week called, “Paris Sweets”, which includes a recipe for Chocolate Thyme cake. I guess that using herbs traditionally included in savory foods to season sweets is a very European approach. Jennifer, thanks for noticing. It is indeed the 1 year anniversary of this blog. I am going to celebrate with two different recipes this weekend. I made these last night except that I used anise instead of basil or mint. I used the same amount of liquid and sugar for the syrup, but I replaced the basil/mint with 2 star anise seed pods. Loved it! I think the anise flavor was a little too subtle for this combination, though, because I could barely taste the anise with the raspberry mousse, which was also GREAT! I still liked the anise cream a lot, though, so I might try something else with that. Thanks for the fantastic inspiration! This sounds so interesting and different. Sound very fresh tasting. I can’t wait to try it out. Your pictures are lovely, and I love your commentary. I’ll definitely want to try your coffee one. What do you think of putting semi-finely ground dark-roast espresso beans in the filling? (I put that in my homemade ice cream and it’s killer!) Keep up the beautiful work! Also I have been looking at your site for awhile and your photos do your work so much justice. Who takes the photos? What sort of camera do you use? I made these cupcakes yesterday and while i was generally pleased with the cupcake itself and the mint cream, I had a lot of trouble with the raspberry mousse… unsurprisingly, when I mixed the gelatin in and refrigerated it it became hard and gelatinous which made for a lot of trouble when mixing it with the whipped cream… logic would dictate that it would be hard and gelatinous, but from the pictures it seems a lot smoother, i ended up with a few chunks in my frosting (sort of gross). I imagine there’s something I could have done differently, like stuck it in a blender, if I wanted to make sure it was smooth, but I was trying to follow the instructions. Is there something I did wrong? Hi, Blair. Baking isn’t easy, or straightforward – that’s for sure. There are so many variables that can impact the outcome. The best tips I (or anyone) can give is on how to recover from things that could go wrong. There are lots of things one can do, many I learned from experimenting myself, through classes, or even from food TV. In this case, if I noticed that the mixture was too stiff, I would warm it slightly over a water bath before folding in the whip cream. First let me say, when I first stumbled upon this lovely-ness of a site I was flabbergasted. I had no idea a world of food blogs, correction, cupcake blogs even existed. I was up until 1 am exploring your beautiful site. I have made quite a few of your recipes and enjoyed every single one. You’ve been a true inspiration. I’ve been baking with my grandmother since age five, and as busy as life has gotten I’d forgotten my passion for the art. So thank you, for awakening it. I did have a question, I plan to make these cupcakes next and I wanted to know if I needed to refrigerate these because of the mousse frosting? I know you get compliments on almost a daily basis, but truly, thank you. Baking makes life just that much more beautiful. Blair and Razzie, I had the same result as both of you did with the rasberries jelling too much. I just put the container over a double boiler until it became workable again, let it cool and folded into the whippped cream and it went on the cupcakes perfectly. I refrigerated mine until serving time because of the cream filling and not wanting the mousse to get soft. BTW, all the guests raved on the mint and basil flavors!! A friend of mine moved from Arizona to England and I made these for her farewell party…..Delicious!! !They were a perfect treat to send her off on her new adventure. I reduced the amount of sugar by about 2 ounces and divided it up into white, light brown and brown sugar (which I typically do in most recipes). I used two eggs which might best be described as jumbo (they are 85g each). I used soy milk for the regular milk (it’s worked in other recipes of yours). My cupcakes rose so much that some of them started literally erupting over the side of the cup. I left them to cook hoping that they would eventually stop which sort of happened. Eventually I checked them with a toothpick and they all seemed cooked but they deflated quite a bit afterwards and some of them are somewhat lopsided in how they rose (they’re perfectly acceptable but I wondered if I should just have left them to cook longer in spite of the toothpicks coming out clean). Any ideas? Thanks so much in case you reply. (They taste fabulous btw, so that’s not an issue at all). hi! I absolutely adore your site. 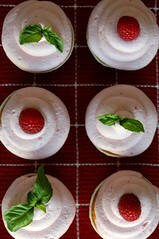 anyway, my question is..other than raspberries, what other fruit can I use to go with the basil/mint cream? thanks! 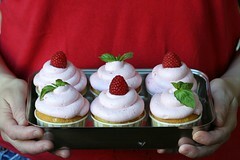 I made these this weekend, as mini vanilla cupcakes with the raspberry mousse frosting. not quite as exciting without the filling but they were a huge success. the frosting was delicious! as a bonus, after lurking and reading many many recipes on this site i finally baked cupcakes that didn’t overflow! thanks for the great recipe – i love your ideas. Thank you for posting this! I just made these today and already posted about them. They made a wonderful addition to a very pink birthday! They taste yummy, but they expanded and ended up a bit flat, pre-frosting. But Im sure post frosting, itll look wonderful! But hey, do you think i could bake this recipe as a birthday cake? Awesome website, I’m going to be addicted! I am going to try to make these but do you have any pics of how you did the filling/chopping off the top and making the cone? I want to make sure I am doing it right. Also, can I have your blessing to repost your recipe, with a link back to you, on my blog? This sounds really lovely. I’ve been hunting for a cupcake recipe that didn’t use buttercream and I NEVER would have thought of a raspberry mousse cream. It sounds delightful, I cant wait to try it! Thanks!! First off, I love this site! I’ve been slowly trying to make some of these cupcakes (the thyme, blueberry, and peach cupcake was phenomenal!). I tried to make this one with chocolate cake, but I had some trouble with the mint cream. First, I don’t know how to tell how much 5 oz of fresh mint is. Second, I didn’t know how fine to chop the mint. The filling tasted good, but the texture was of chunky mushy plant. How do I fix the filling I’d really love to give these another go! Thanks!